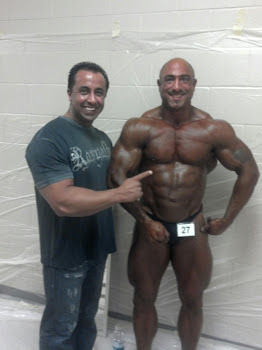 Always A Bodybuilder: Spray tanning booths… who would think? 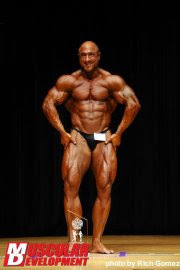 Back in my day (mid 80’s) when I used to compete, preparation for competition was tanning everyday for 30 minutes, (you can never be dark enough for the stage) which was how long the sessions were back then, we’d even pull doubles. Boy you would sweat out so much water, which was nice before a show. 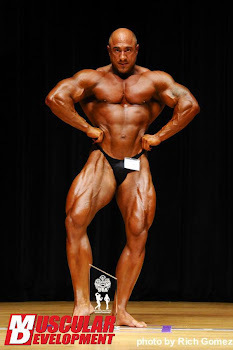 Earlier this year, I started to tan 3 months out from the Jay Cutler classic on May 4th. Tanning now is only 12 minutes, not much sweating these days, but you still get dark, well maybe not dark enough for competition. My friends in the gym were starting to make fun of me because I was so dark. I even used Jan Tan, a product that you paint on you the day or so before a show, that actually washes off and doesn’t stain anything. I remember from back in the day, I used to use this product called Pro Tan, now this stuff doesn’t come off, in fact, its on you for a few weeks and stains everything, but if it doesn’t turn you green or orange (some people) you’re good to go with a deep rich dark tan, perfect for competition. He told me to save my money and come down to one of his place, he has a spray booth that will do the trick. Spray booth are you joking me? What is does, if I understand what Mark said to me, the solution that is sprayed on you works with the proteins in your skin and kind of causes the air to oxidize your skin, as an apple would if pealed and left out in the air. Spray Booths are quite effective. They deliver the results expected in a better and faster way.